Reflections of a Grady Doctor: Twenty-twos. Us on rounds yesterday: Size matters. Me: "Did you hear that heart murmur?" Intern: "No. . . I didn't hear it." Me: "That's because your stethoscope is too long." Intern: "What? It's the same size as yours." Me: "Ehhh, no, sir. 'Tis not." Student: "I didn't hear it either." Me: "You need a twenty-two incher." 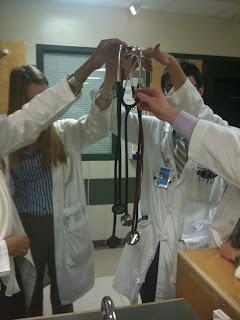 Intern: (holding up stethoscope) "I thought mine was the short one." Intern: "Darn. I cut mine to make it shorter." Me: "I've cut a few in my day. But don't go cutting up stethoscopes. Just get a twenty-two." Student: (eyes widening) "Whoa. Is it really better, Dr. M?" Me: "Well, it depends. You are more likely to get coughed on, barfed on, accosted, licked on the cheek or infected with TB since you're only twenty-two inches away. But you won't miss any heart murmurs." I love the medical students. 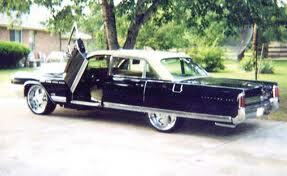 This ain't the only time you need to be rollin' on twenty-two's.